These Easter eggs are created with my creamy and soft Peanut Butter Fudge Recipe. 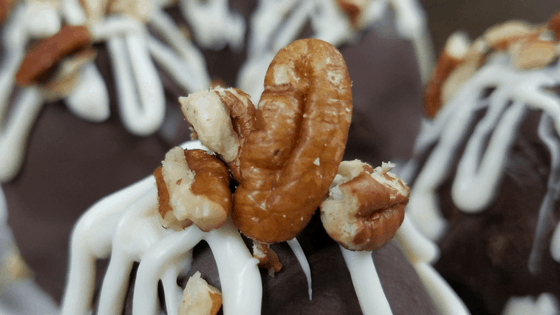 They’re dipped in milk chocolate and sprinkled with pecans. By adding a creamy center to create the “yolk” for the egg it creates a fun and pleasant surprise! These eggs have two different centers: peanut butter cream and milk chocolate cream centers. These fun Easter treats are created using plastic Easter eggs from the dollar store. I sprayed non-stick spray inside each egg and used a paper towel to spread the oil around. I also used an egg carton to keep the eggs upright during the filling and chilling process. As mentioned above, I made two different cream centers for these eggs. I made a creamy peanut butter center and a milk chocolate cream center. The trick to these eggs is to let them chill in the fridge and let them become firm. They will come out of the plastic eggs relatively easy using a plastic knife. I used a melon-baller to create centers for these eggs. After placing the filling in each side of the egg, I smoothed out the line after putting the egg back together. I used lollipop sticks and inserted them a little over half-way in the eggs to make for easier dipping. I chilled the eggs once again to make the chocolate dipping go smoothly. For this, I just used prepackaged melting chocolate and microwaved according to the directions on the package. I made sure to use a bowl that was deep enough and not too wide. That way the eggs would dip deep enough to get a good covering. After they have hardened, remove the stick and drizzle chocolate and garnish with pecans or other fun toppings.